This is the second post of a collaborative series of posts with Elements Beauty Shop about skincare. (Check out the first one here.) Because it’s been super cold here in Richmond for the past week or so, we decided we’d share some winter skin savers. 1. 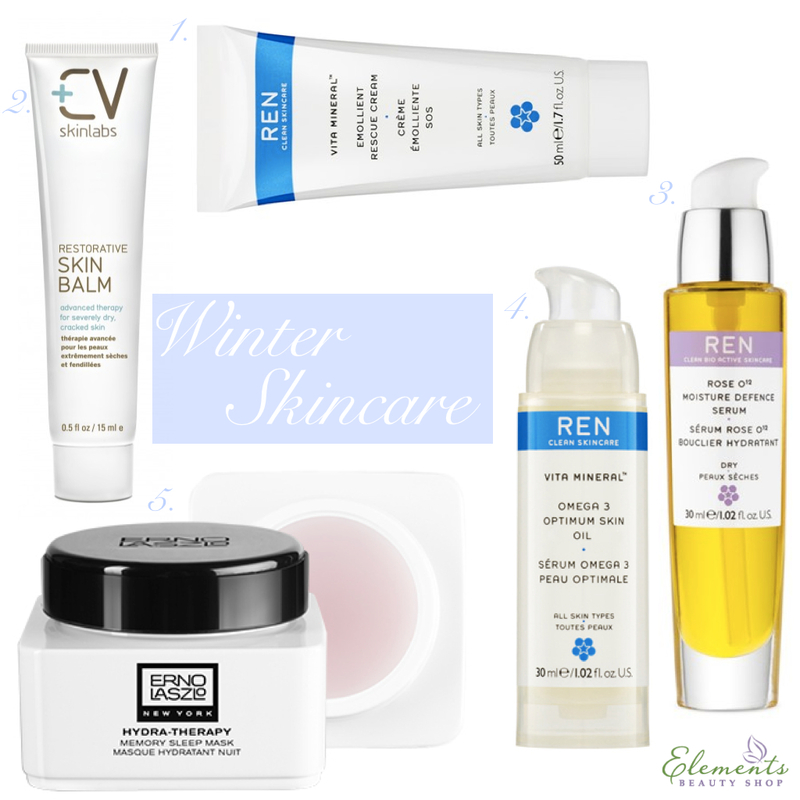 REN Vita Mineral Emolient Rescue Cream: I love using this on any spots of dryness (like the corners of my mouth). I’ll put it on before I go to bed, and even dab it on over my makeup throughout the day if I need to. 2. CV Skinlabs Restorative Skin Balm: Sherry and Jeanie had nothing but good things to say about this stuff. The consistency reminds me of Elizabeth Arden’s Eight Hour cream: that thick, vaseline texture that’s good for super, super dry spots. 3. REN Rose O12 Moisture Defense Oil: This smells amazing, obviously, but it seriously does the job too. I mentioned it first in my Best of Ren post, where it’s described as a “blanket for your skin.” I like to put this under my moisturizer before bed. 4. REN Vita Mineral Omega 3 Optimum Skin Serum Oil: Leslie, the Ren rep mentioned here, was kind enough to send me a bottle of this to try and it’s great! It’s not quite as thick as the rose oil, so I can use this one during the day too. Omega 3 from Vegetal Plankton and Gold from Pleasure Oils are supposed to promote natural cell renewal and optimum moisture levels to restore firmness and elasticity. 5. Erno Laszlo Hydra Therapy Memory Sleep Mask: I can’t even believe how soft my skin is when I wake up after using this. It has the coolest texture. Apparently it’s “based on memory foam developed for the NASA space program, the weightless gel texture bounces back, cushioning the skin to restore youthful elasticity overnight.” How crazy is that – NASA?! I bought this last month and it’s my favorite new product. If you have issues with dry lips, Jeanie and Sherry recommended the Pure Marula lip balms. It has micro-encapsulated marula oil, beeswax and mango butter for barrier protection and Kokum oil for skin rejuvenation. I can’t wait to try it. Use the code “Tiramisu” at ElementsBeautyShop.com for 10% off your purchase! 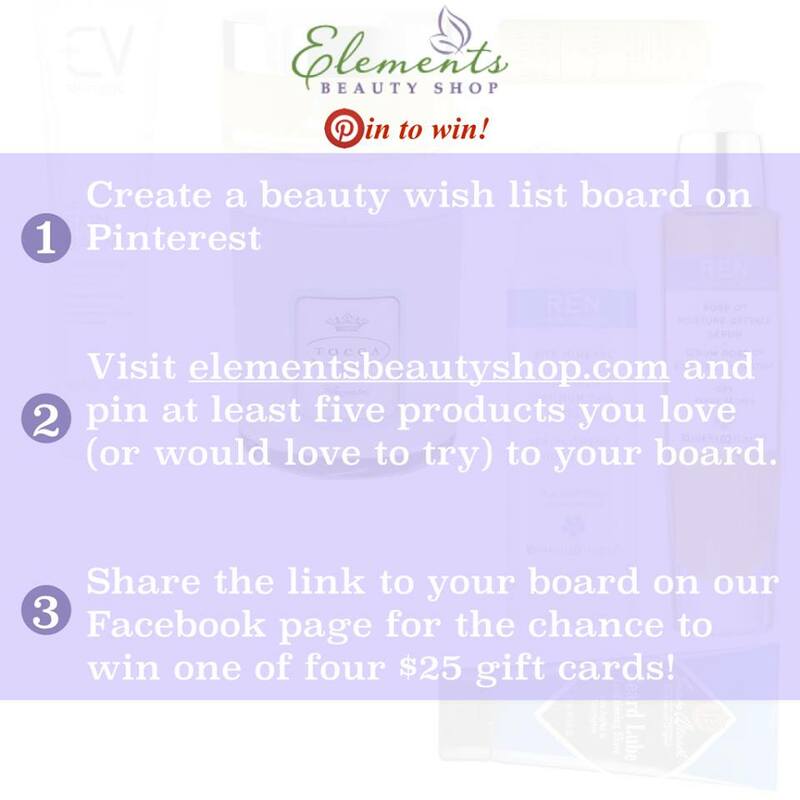 I’m also super excited to tell you about the Elements Beauty Shop Pin To Win contest! All you have to do is create a beauty wish list on Pinterest (here’s my board), and you could win a gift card! ! Check out the details in the image below and click through to enter on Facebook. *This post is a sponsored collaboration with Elements Beauty Shop. All opinions are my own. PS: Elements also teamed up with a few more bloggers, so be sure to look out for their posts (I’ll be sure to share them on my Facebook page).